70 Years of Recorded Music is a special two-LP box set presented to those attending a luncheon given in honor of Robert W. Sarnoff, the Chairman of RCA Corporation by the London Chamber of Commerce and Industry at Draper's Hall in London, England, on October 20, 1971. The first LP has an orange RCA Victor label and contains tracks by RCA's popular artists including Benny Goodman, Elvis Presley, Julie Andrews, Perry Como, and Harry Nilsson. 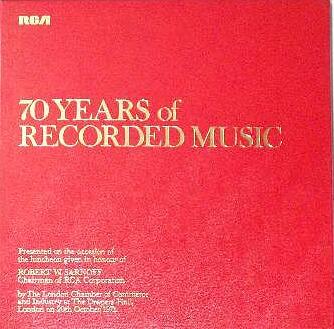 The second LP has an RCA Red Seal label and contains classical selections.